If you thought the drunken debauchery of former U.S. District Judge Walter S. Smith, Jr. of Waco, Texas was old news, think again. A motion filed this morning by a federal death-row inmate asks the court to set aside his sentence on the grounds that the alcoholic judge was too impaired to pass judgment. In the motion filed by attorneys Robert C. Owen of Northwestern Law School and Asst. Public Defender John R. Carpenter of Tacoma Washington on behalf of Brandon Bernard, they cite records from a judicial misconduct complaint that I filed against Smith in 2014, including the deposition testimony of a former deputy clerk who says she was sexually assaulted by Smith in the federal courthouse in 1998 while he was drunk (I have uploaded the motion’s evidentiary exhibits below). Bernard was sentenced to death for his role in the 1999 murders of Todd and Stacie Bagley, a married couple who served as youth ministers for a church in Iowa. In the interest of full disclosure, I am a pro bono co-counsel for one of Bernard’s co-defendants in the murder cases. Although I normally do not practice criminal law, and I certainly do not dispute the horror of the Bagley murders, I happen to think that defendants have a right to be sentenced by a judge who is not drunk. Is that really such a radical idea? One witness told me she saw Smith drinking alcohol during a lunch break while he was presiding over the Branch Davidian trials, which would have been around the same time that Bernard was sentenced (and around the same time that Smith grabbed and groped the female clerk in Waco). Smith handed out some notoriously harsh sentences to the Branch Davidians, and I believe it’s fair to ask whether he was drunk when he sentenced them. Frankly, I hope other defendants start challenging their sentences, because it may force the rest of the judiciary to confront its complicity in Smith’s misconduct. Other judges knew about Smith’s chicanery, but they did little or nothing to stop it. 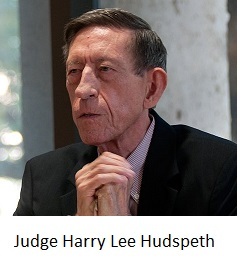 Smith’s victim testified, for example, that she informed her supervisors about the sexual assault, and they informed the chief judge of the Western District of Texas at that time, Harry Hudspeth (who has always reminded me of Emperor Palpatine). According to the deposition transcript, Hudspeth dismissively asked the victim what she wanted him to do about it. Ultimately, he did nothing. (I filed a misconduct complaint against Hudspeth, and he quietly retired before the Fifth Circuit Judicial Council released its investigative report). A courthouse source also told me the former Chief Judge of the Fifth Circuit, Edith Jones, traveled to Waco in 2008 to interview courthouse personnel about Smith’s drunkenness, and she gave him the option of entering rehab or facing suspension from the bench. After a few weeks in rehab, Smith returned to the bench to resume his reign of terror. After the Fifth Circuit confirmed my allegations regarding the 1998 incident, the appellate judges suspended Smith for one year and ordered him to participate in counseling. I argued the sentence was a slap on the wrist, particularly since Smith pulled some dirty stunts during the investigation. The Fifth Circuit did not investigate incidents involving other alleged victims, even though I gave its investigators the names and telephone numbers of witnesses and alleged victims. 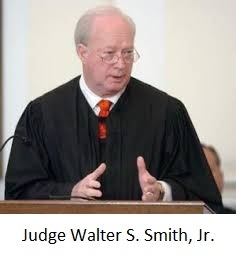 The Judicial Conference of the United States ruled in my favor and ordered the Fifth Circuit to investigate the other alleged incidents, but Smith retired before the investigative report was released. And I doubt that his case was an outlier. Just remember how hard the Fifth Circuit tried to cover up the drunkenness and sexual misconduct of former Judge Samuel Kent of Galveston. Back in Waco, Judge Lee Yeakel must now decide whether Brandon Bernard gets a new sentence, and frankly I hope he permits discovery into the extent of Smith’s drunkenness and dereliction. It’s a relevant question, and it may gave us some idea of how many other defendants were affected (and perhaps how many other judges knew about it). The #MeToo movement has hammered sexual predators in Hollywood, big journalism, and Congress, but it still needs to hammer the judiciary (just read my July 11, 2016 blog post, Sexual misconduct in the federal judiciary: where are the Democrats and feminists when I need them?). Fortunately, a reporter from a major online publication called me yesterday because she is working on a story about sexual misconduct in the federal judiciary. I can’t mention her name or publication yet, but kudos to her. It’s a scandal that needs to be exposed. Senator Charles Grassley periodically introduces legislation to replace the current judicial oversight system (which allows judges to whitewash investigate one another’s misconduct) with an independent inspector general for the judiciary. Unfortunately, he has never scheduled a hearing on that legislation in the many years since he first introduced it, even though he is the chairman of the Senate Judiciary Committee. What gives, Mr. Chairman? If it’s an idea worthy of legislation, then quit issuing press releases and start scheduling hearings. Here are the five exhibits attached to the motion filed on behalf of Brandon Bernard: Exhibit 1, Exhibit 2, Exhibit 3, Exhibit 4, and Exhibit 5.